Did you know that Wilfrid Laurier University is a designated AshokaU Changemaker Campus? If you’re inspired to drive positive change, register for Laurier’s first-ever Changemaker Innovation Challenge (CIC) by Jan. 28. The challenge is open to Laurier students from all faculties, levels of study and campuses. Organized by the Schlegel Centre for Entrepreneurship & Social Innovation, the CIC offers an opportunity to become a changemaker. Through the CIC, you’ll learn how to take a systems-thinking, learning-first approach to changemaking while challenging yourself to think about social and environmental change in a wider context. This year’s CIC challenge focuses on mapping systems of change as part of Map the System, a global competition that encourages students and educators to think differently about social change. Social change is complex. Understanding the problem and mapping out a system to comprehend its complexities are key to effective changemaking. Register for Laurier’s Changemaker Innovation Challenge. (You may apply individually and add to your team later). Once you’ve registered for Laurier’s CIC, you will be supported by weekly workshops between Jan. 30 and Mar. 20, where Laurier faculty, staff, alumni and community members will provide mentorship and help develop your changemaking idea. You’ll also meet other Laurier students registered in the challenge and identify teammates. The final submission deadline is April 1. Laurier’s judging committee will review all submissions and select internal winners, with one team selected to represent Laurier at Map the System’s Canadian finals in Toronto in May. The successful team at the Canadian finals will go on to represent Canada at the Map the System global finals in Oxford, England in June. 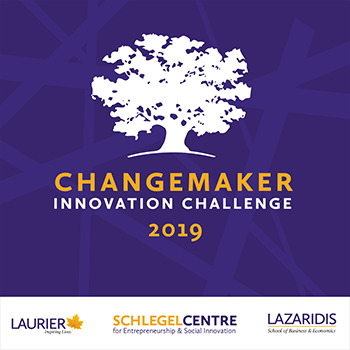 The Changemaker Innovation Challenge is the culminating event of Changemaker Awareness Month at Laurier, celebrated annually in January and dedicated to inspiring members of the Laurier community to become changemakers. Have questions? Please email Sam Haas, programming and student engagement coordinator in the Schlegel Centre for Entrepreneurship & Social Innovation.